LOS ANGELES – 2 July 2018 – The Generic Names Supporting Organization (GNSO) is looking for expressions of interest to chair its Expedited Policy Development Process (EPDP) team on the Temporary Specification for gTLD Registration Data. The EPDP team is being formed following the adoption of the Temporary Specification by the ICANN Board, which went into effect on 25 May 2018. The EPDP team is required to complete its work before the expiration of the Temporary Specification on 24 May 2019. The GNSO Council is looking to appoint a neutral Chair to the EPDP team. While the EPDP Chair may be a member of a group already represented on the EPDP team, the EPDP Chair shall not act in a manner which favors such group. With such an important issue under consideration, significant responsibility comes with the role to ensure the success of deliberations. The EPDP team is expected to have weekly calls, although it may be necessary to hold multiple calls per week. Additionally, the EPDP team may have multiple face-to-face meetings in order to meet the required milestones of the EPDP. 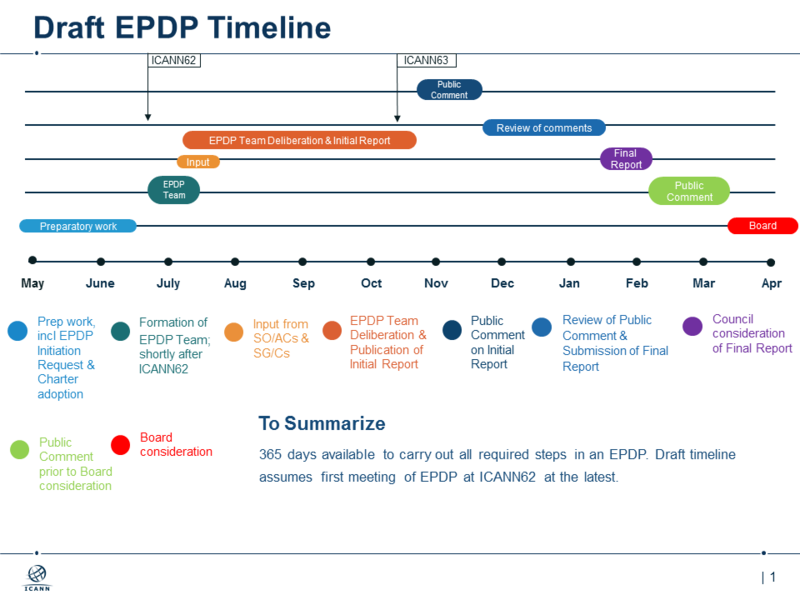 An illustrative timeline has been included in Annex B; the bulk of the EPDP team work is expected to take place between now and February 2019. There will be no compensation associated with the role of the EPDP Team Chair; however, travel associated with any face-to-face meetings may be supported. What is your interest in this position? What particular skills and attributes do you have that will assist you in chairing the EPDP? What is your knowledge of the Temporary Specification for gTLD Registration Data and associated requirements particularly as it relates to the EPDP? What is your experience in and knowledge of the GNSO Policy Development Process and domain name registration process as it relates to ICANN? Are you able to commit the time required and necessary work needed to chair the EPDP? Conflict of Interest Statement – do you have any affiliation with or involvement in any organization or entity with any financial or non-financial interest in the subject matter of this EPDP? A statement confirming your commitment and ability to act neutrally. Expressions of Interest are to be submitted to EOI-EPDPTeam-Chair@icann.org by 13 July 2018 at 14:00 UTC. Application materials will be reviewed by the Council leadership and/or a designated committee and will not be shared publicly. Names of applicants, including the recommended candidate, will be shared with the GNSO Council for its consideration. The Council leadership and/or designated committee is expected to provide its recommendation to the GNSO Council in time for the GNSO Council meeting scheduled for 19 July 2018. The EPDP team is expected to convene for its first meeting shortly thereafter and is expected to be asked to appoint two vice-chairs to support the EPDP Team Chair. Additional questions and inquiries can be sent to EOI-EPDPTeam-Chair@icann.org. For more information on the Temporary Specification, please see https://www.icann.org/resources/pages/gtld-registration-data-specs-en. Additional information about the EPDP is located in Annex-A1 of the ICANN Bylaws https://www.icann.org/resources/pages/governance/bylaws-en/#annexA1 and the EPDP Manual https://gnso.icann.org/en/council/annex-4-epdp-manual-30jan18-en.pdf. As outlined in the GNSO Working Group Guidelines (WGG), the purpose of a Chair is to call meetings, preside over working group deliberations, manage the process so that all participants have the opportunity to contribute, and report the results of the Working Group to the Chartering Organization. These tasks require a dedicated time commitment as each week calls have to be prepared, the agenda concretized, and relevant material has to be reviewed. The Chair shall be neutral. While the Chair may be a member of any group which also has representation on the EPDP Team, the Chair shall not act in a manner which favors such group. The Chair shall not be a member of the EPDP Team for purposes of consensus calls. In addition, it is required – that interested candidates have considerable experience in Chairing working groups, and direct experience with at least one GNSO Policy Development Process throughout its lifecycle would be an advantage. Familiarity with the functioning of a Working Group is important to understand the various leadership skills that are necessary to employ during a WG’s lifecycle. For example, a chair has to ensure that debates are conducted in an open and transparent matter and that all interests are equally represented within the Group’s discussions. During the later stages of a WG when recommendations are drafted, a Chair will benefit from understanding the viewpoints of various members to ensure that an acceptable and effective outcome – ideally in form of consensus – can be achieved. Encourage and, where necessary, enforce the ICANN Standards of Behavior. Conduct consistent timely reporting to the GNSO Council on the progress of the EPDP. Finally, as also pointed out the in GNSO Working Group Guidelines, ‘appointing a co-chair(s) or vice-chair(s) may facilitate the work of the Chair by ensuring continuity in case of absence, sharing of workload, and allowing the Chair to become engaged in a particular debate.’ As a result, similar tasks and skills are expected from vice chairs, although the overall workload may be reduced as a result of being able to share this with the chair.